This competition sought to re-vision the use of a surface parking lot in downtown Flint, Michigan as a prototype for place-making on this ubiquitous urban and suburban typology that exists in all American cities. 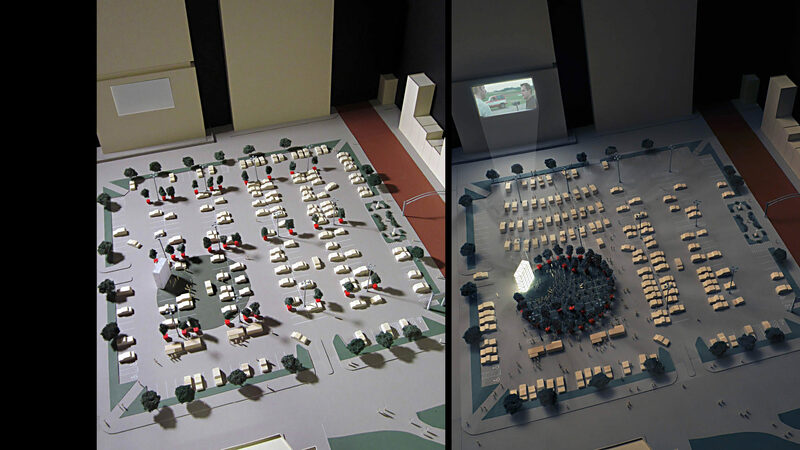 Our competition proposal thus examines how to transform this typology into a temporary public space that will captivate the imagination of both the pedestrian and the driver in a highly utilized surface parking lot in the center of Flint, Michigan. OFFICE 52’s vision begins with an urban oasis that encroaches from the river to the north. A 100 foot circle of green is superimposed on the northeast quadrant of the lot. 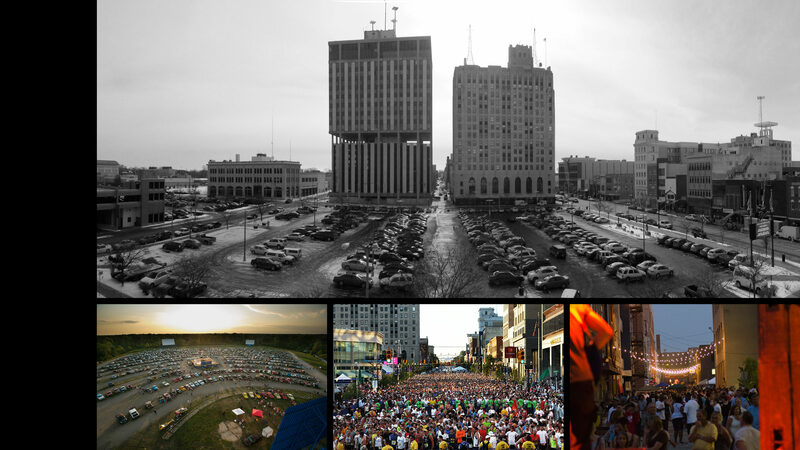 The circle is the connecting node in an important network of reclaimed and transformed spaces in a city that is seeking revitalization and re-imagination in a post-industrial context. During the day, immovable components occupy just 8 parking spaces, as mandated by the competition brief, as the lot serves its daytime parking functions. After hours and on weekends, elements are relocated and the circle becomes a venue for shows, festivals and special events. Our proposal is built around a kit-of-parts consisting mostly of recycled, re-used and re-usable materials. The 100 foot green circle is fabricated from artificial turf salvaged from a nearby arena undergoing renovation. A flat topped mound forms a stage. A scaffolding tower clad with recyclable Tyvek creates a backdrop for performances, a projection booth and visual beacon in a horizontal landscape. Honey locust trees in mobile boxes nest around existing light poles during the day, bringing much needed shade and scale to the lot. 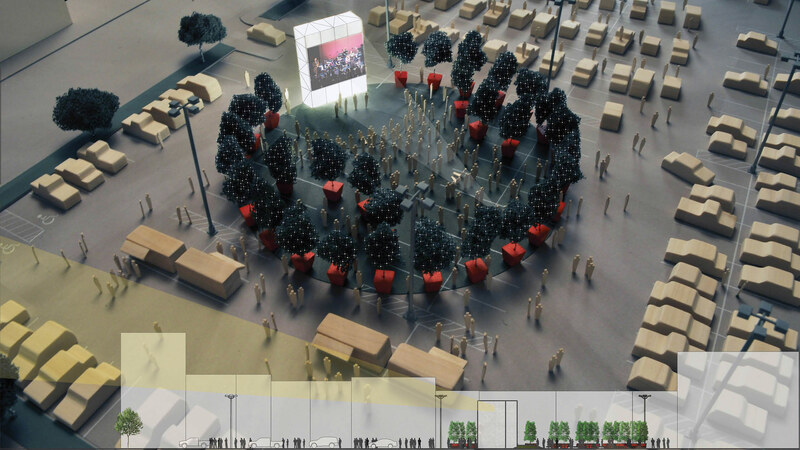 After hours, the trees move to create different spatial configurations and seating around the green circle. A custom, reusable Tyvek media banner hangs for projections/movies on the abandoned and neighboring Genesee Tower. Food carts adjoin the circle to bring added vitality and enjoyment. In the immediate vision, all the materials can be recycled or donated back to the community leaving no physical trace of its presence but an indelible cultural imprint. 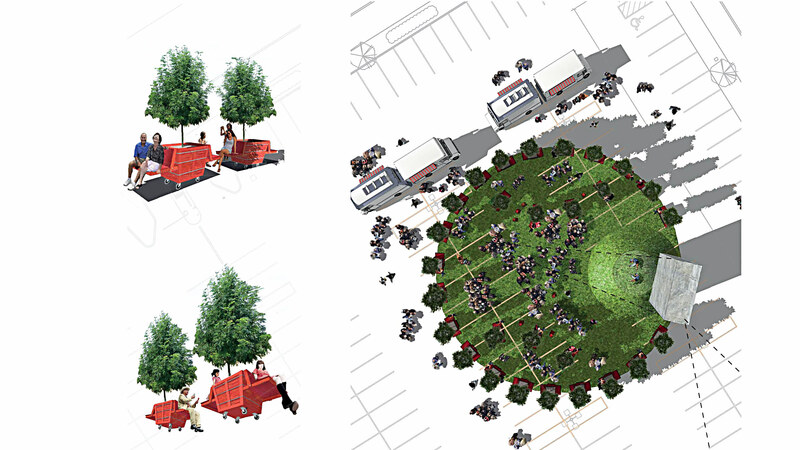 In the longer vision, the circle becomes a permanent feature in a future urban space that is part paved square, part parking lot and part village green. 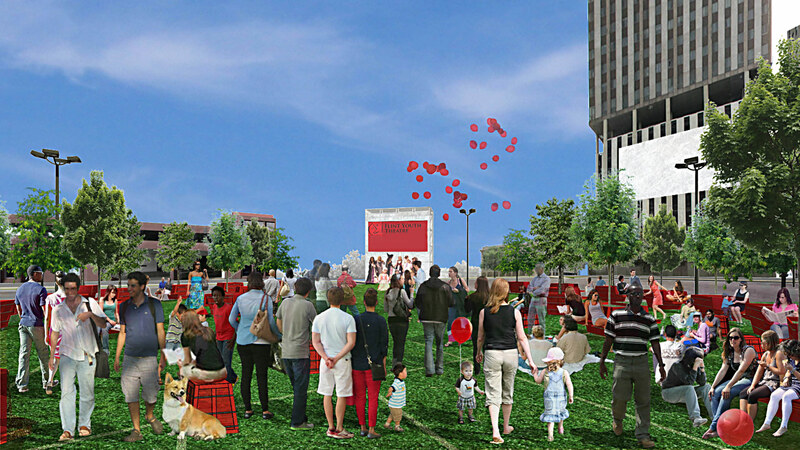 It is a transformative vision for a re-imagined post-industrial city.